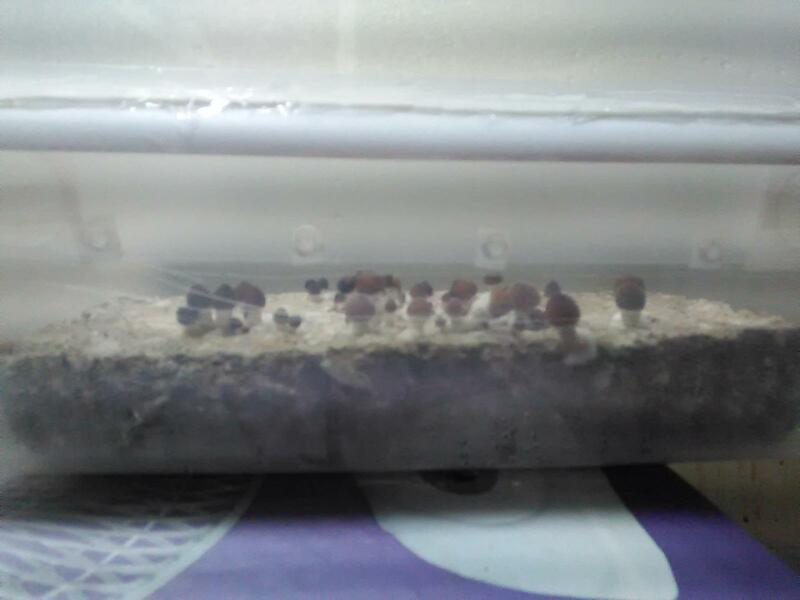 My first tub grow since returning to mycology, last fall. 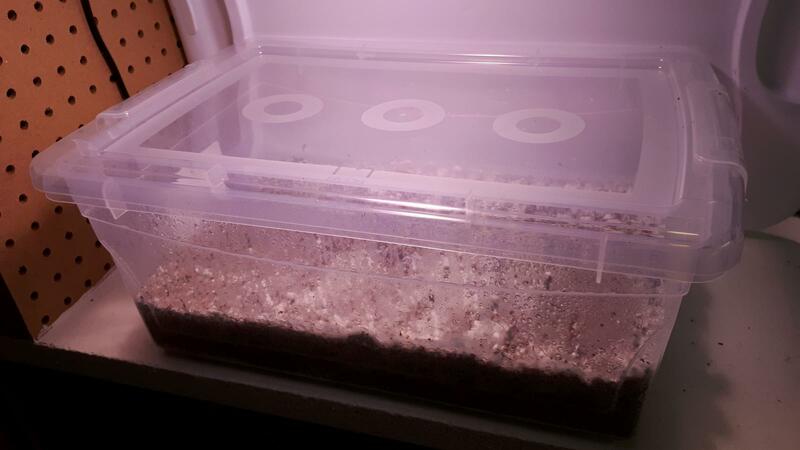 Hey, this newfangled coir/verm thing actually works. OK, it's just one teeny pin, but I'll dance if I want to. Shake what the goood looord gave ya!! A bunch more pins have appeared, since this morning, so I'm really shaking it, now. Nice! Hey do you mind if i ask how you got your tub set up, is it a dubtub? How do you(or DO you) have the hole configuration, and are you using polyfil? I am fascinated with how mono/dubtub FCs work, and I like to see different designs. It's just a small, shallow tub, with no special holes for gas exchange, no liner, and a loosely-fitting top. I'll take a pic, later. I haven't cased it, or misted. It was closed up until late yesterday, when I decided to give it a bit of air. Now I see a bit of blue on some of the surface-fuzz, so I guess I need to raise the humidity. I think I'll convert it into a dub, and start misting regularly. The next time I do this, I'll probably add a thin verm casing, to keep things nice and moist. OK, this is all there is to it...just a shallow box, 7" deep, 15" long X 10" wide. I have a second one the same size. Maybe I'll "dub" that over this one? Or else take the lid off and drop the whole thing in an SGFC. I guess I should get the humidity up, since a bit of that surface cotton has turned a rather pretty blue. Substrate is only a couple of inches deep. I did a big tub at the same time, but it's been a lot slower to fill in. Edited by WalkingCatfish, 03 January 2019 - 08:03 PM. Cool, keeping it all simple is good. Huh, pins in my big tub, this morning. I guess I should dance, but I'm kinda sore from all that shaking, yesterday. 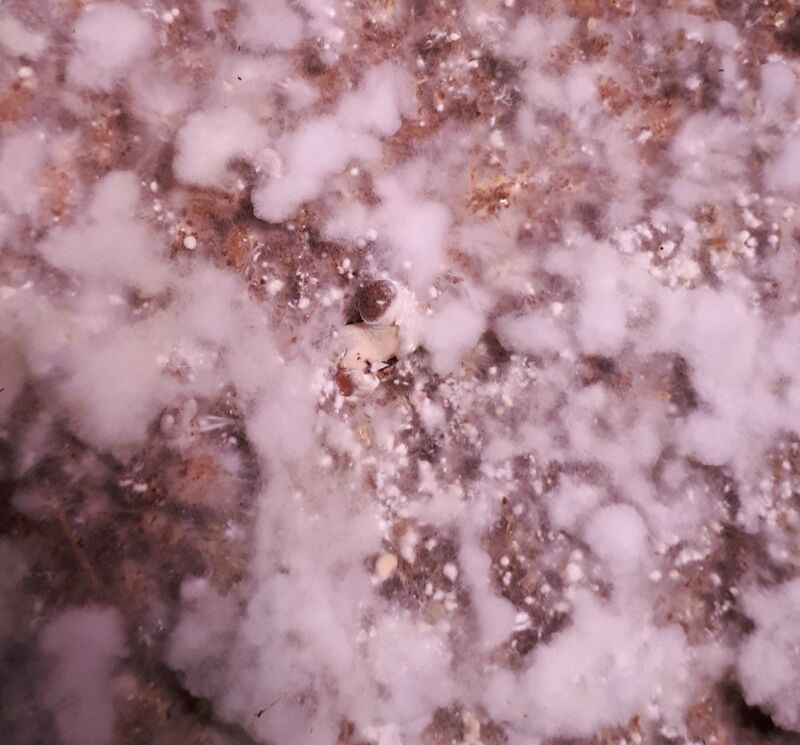 The Yellow Oyster kit I bought is starting to fruit, too...not "pins" exactly...more like hideous (but strangely alluring) blobs. Hmm...looked at the bottom of my small tub. Waaaaay more pins there. Not dancing so hard, today. Obviously, I have more to learn about growing in tubs. 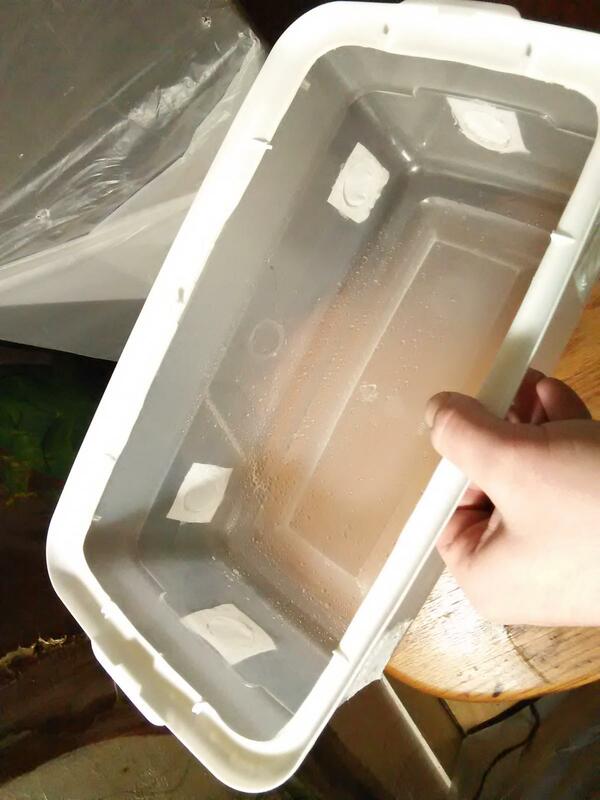 I had used a thick ml black heavy duty liner, and because the air in my house is so dry, it will pin on the bottom like that, because it wants to fruit where there is sufficient moisture. If the sub surface is not ideal, and the moist area between the liner and sub might be better. You also might be fanning too much, I am also learning, right about where your at, but I have had a few successful minitub grows, and it takes a bit to get the FAE/RH thing right. Keep trying man. Edited by Billcoz, 05 January 2019 - 04:34 AM. Thanks, Bill! Oh yeah, I'll keep at it..I'm having too much fun to quit. It looks like I'll get a decent flush from that little tub anyway, so I'll try not to think about the nightmarish, wriggling mass of squashed, doomed pins on the bottom, lol. Yeah, I'm I am having trouble with my latest tub too, so while I am getting better at that I'm do a big batch of pf cakes to get my stash back up to par after xmas gifts, the new year, and also the other night I went HARD and ate 12g lol, and now I'm down to a couple ozs, so that's no good. It amazes me how the squished, trapped pin can find their way out, but they can be ugly, but just as active. Her's the tub I'm having trouble with. 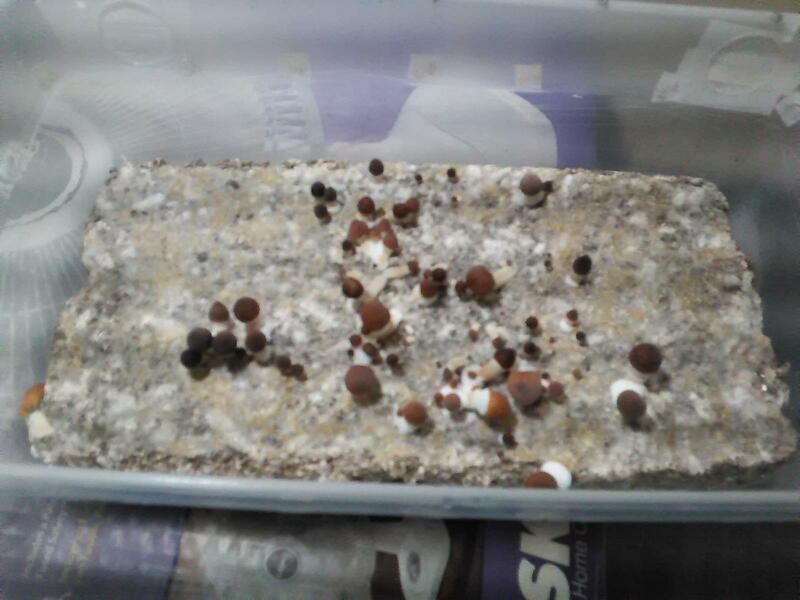 It had 0 pins on top at day 25, but pins were forming on the bottom, so I flipped it, they matured and I picked em. By then pins were again forming on the bottom, so I soaked it, and flipped it again. Notice how yellow some of the sub is? Edited by Billcoz, 07 January 2019 - 12:40 PM. Oh yeah, that one kind of looks like mine. I've decided I need to do a casing, next time, to and start the "rain" a bit earlier. 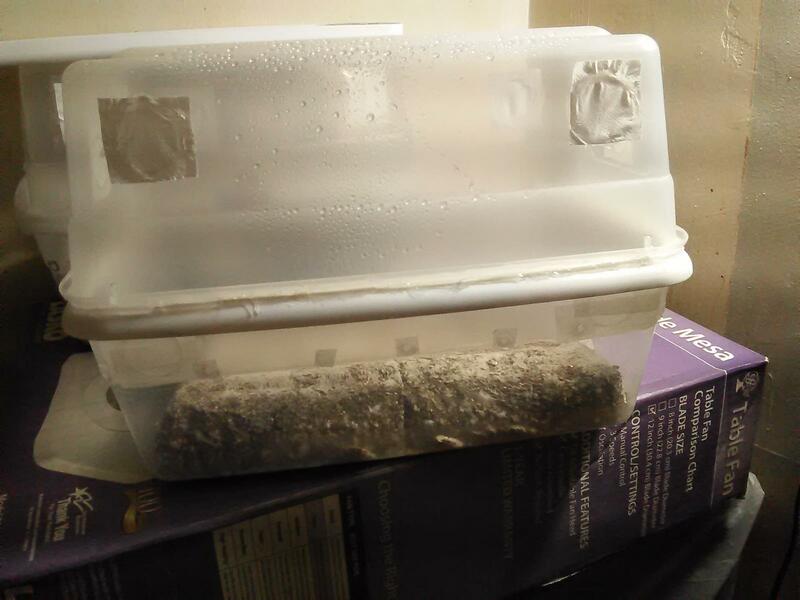 I was about to make a post and ask if 8 days into colonizing the sub is too late to add a casing, what do you think? I think I'm not entitled to have an opinion till I grow some good flushes in a monotub. Okay, well, you mighta read about it or somethin, lol that's fine. I guess I'll have the answer soon. After I harvest my first flush from it, I'm going to dig out those delinquent pins, dunk the whole cake, then case it. So what are you gonna case it with?